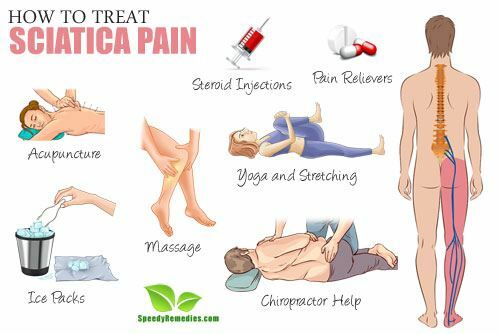 Sciatica refers to the commonly occurring pain, affecting people’s sciatic nerve which extends from the lower back down the back of the leg. Traditionally, it affects only one side of your body and can be intolerable. The pain often gets worse when sitting down. Since it is rarely severe, most of the time, sciatica can be cured with non-operative measures. People suffering from severe case of sciatica that involves leg weakness or bladder changes may require surgery. It occurs when the sciatica nerve becomes pinched. In a few rare cases, the nerve could be being crushed by a tumor or could have gotten damaged due to diabetes. Often, sciatica is a symptom of an underlying disease. Degenerative disk diseases like herniated disk. Unhealthy lifestyle – obesity, not exercising, wearing high heels etc. Lie with your knees bent. Lift right foot and cross right ankle over left knee. Pull left leg towards your chest. Hold for 30 second. Repeat 2 times. Get on all fours, keeping your back straight. Lift opposite arm and leg. Hold five seconds. Repeat with alternating pair. Sit on the floor with your legs stretched out in front of you. Then put your right ankle on top the left knee. Lean forward and hold for 15 seconds. Then switch sides. To counter painful muscle spasms, you can take muscle relaxants. Anti-inflammatory drugs not containing any steroids can help in relieving the pain. Over the counter pain medications will also be helpful. For sharp pain, heat/ice pack can aid in relieving pain. Apply for 20 minutes for every 2 hours. You can alternate between ice and heat. To avoid an ice burn, remember to apply ice with a towel in between your skin and the ice. When the pain becomes intolerable, an epidural steroid injection can reduce inflammation. While it is a temporary relief and might not work for everyone, it can enable a person to continue on with his life’s activities. It is a traditional medicine practice that works on the theory of achieving health by maintaining a flow of energy in the body. Tiny, hair-thin needles are inserted at specific points to open the body’s natural flow of energy. There is no pain felt. The method has been approved by FDA for relieving back pains. Doing yoga or stretching your body can help develop body posture and reduce stiffness and pain. While some activities like sitting, standing for a long time have been found to cause pain, mild forms of yoga is beneficial. It can help people suffering from sciatica to move with ease by strengthening the muscles and improving flexibility. Put your foot up on a chair, and place the outside of your opposite hand on your raised knee (left hand to the right knee or right hand to left knee). Place your other hand on your hip. Turning your upper body while keeping your hips facing forward hold the position for thirty seconds, then switch. Don’t push past where your comfortable. Lie on your back. Bend one knee to 90 degrees angle while keeping the other one straight. Place the opposite hand on the bent knee. Professionally trained healthcare workers like chiropractors can perform spinal adjustment that can aid in taking care of a number of underlying conditions that might be causing sciatica pain. Chiropractic care can lead to a healthier healing environment and provide relief from the pain. Massage therapies have known to benefit the body overall by improving blood circulation, release muscle tensions and enhance the production of endorphins, the natural pain killing chemicals in our body. This non surgical method is a great way to relieve the person of back pain. Most of the time, the above mentioned treatment methods are enough to provide a relief to people suffering from sciatica pain. Exercises, acupuncture, heating pads and others have been known to greatly alleviate the pain. But in some very rare cases, when the pain refuses to subside even after 6-12 weeks and keeps recurring, patients might require a surgery. The aim of performing the surgery is to eliminate the cause of the pain like correcting a herniated disc. Although the non-surgical remedies work most of the time, if your pain persists even after 6 weeks, you might want to visit a specialist.